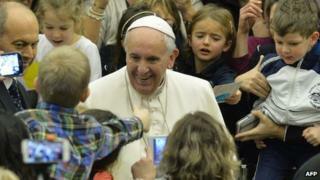 Pope Francis has backed parents who smack their children, providing the child's "dignity" is maintained. He made the remarks during his weekly general audience at the Vatican, which was devoted to the role of fathers in the family. The Pope outlined the traits of a good father, as someone who forgives but is able to "correct with firmness" while not discouraging the child. Some child welfare campaigners have questioned his comments. "How beautiful," he added. "He knows the sense of dignity. He has to punish them but does it justly and moves on." Jon Bird, a spokesman for the National Association for People Abused in Childhood (NAPAC), said it took a zero tolerance approach to the corporal punishment of children. Referring to the Pope's comments, Mr Bird said: "I don't know what he had in mind when he said this. It's about interpretation and where you draw the line." NAPAC's founder, Peter Saunders, who is part of a Vatican commission on protecting children from abusive priests, will attempt to raise the issue with the Pope during a meeting on Friday. Mr Bird added: "There is room for discussion and I'm sure Pete will have that discussion today." The Church's position on corporal punishment came under criticism last year during a grilling by members of a UN human rights committee monitoring implementation of the UN treaty on the rights of the child. The Vatican argued that it in no way promoted corporal punishment, and the head of the delegation said he would take the recommendations back to Rome for review.